eMoneyUnion provides personal loans to borrowers at a representative APR of 9% for a secured first charge on a low LTV property up to 84.5% for unsecured loans to those with low credit ratings. In turn lenders are paid between 7% on similar secured loans and up to 15% for the riskiest rated unsecured loans. The difference between rates for lenders and borrowers can partially be explained by contributions to the provision fund, as borrowers contribute up to 25% of repayments into the ‘eProvision Fund’ that exists to cover bad debts. Expected Returns: Not clear. Gross rates up to 15%, ISA documentation suggests ‘up to 6%’ for highest credit ratings and ‘up to 10%’ for low credit and secured. Cashback: £20 on £2000 invested (1%). Innovative Finance ISA: Registration via justus.co for early access. eBidPal is a feature that enables you to make loan offers to new borrowers as soon as they become available. It is the best way of making use of your capital so that it is always working for you as opposed to sitting on deposit earning little or no interest. 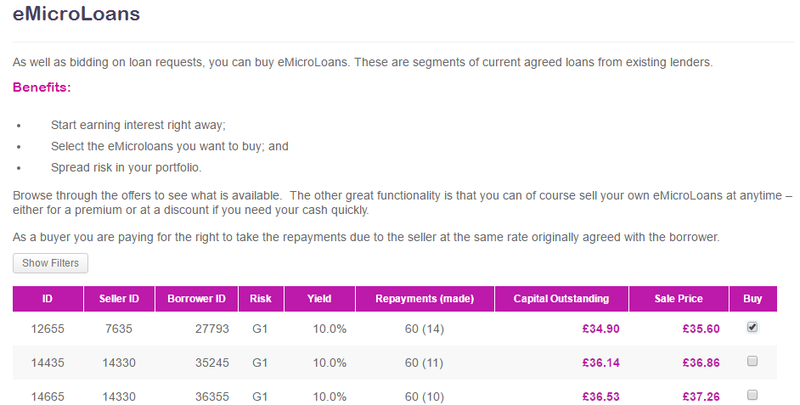 If you choose to use eBidPal you will be able to choose which Risk Rating borrowers you would like to lend to and the denomination you would like to lend to each borrower. Example: You have £2000 to lend, and you would like to lend to Risk Rated AA and you would like to lend £100 to each borrower, you will essentially have placed bids to lend with 20 borrowers within that particular risk band. The first thing I noticed when using eMoneyUnion was its similarity to another platform called RebuildingSociety. Looking at the code I saw the same WordPress implementation with even the same plugin ‘Ameuri’ which appears to handle most of the peer-to-peer lending features. WordPress is a ‘content management system’ which allows easy development of websites (such as this one). It means that instead of building the site from scratch, they just used WordPress and some free plugins like ‘buddypress’ for user management ‘w3 total cache’ for performance, then programmed their own custom plugin for all the peer-to-peer functionality. You can check for more detail with this detection tool if you are so technically inclined. Later I found out that eMoneyUnion was a white labelled solution provided by a sister company of RebuildingSociety. For lenders in the platform this brings pros and cons. On the upside, you may feel there is less platform risk: using a white label solution eMoneyUnion does not have to keep a large IT team on the payroll, so in theory would have less risk of going bust. On the downside, what happens if there is some hack or emergency with the website? Would eMoneyUnion be reliant on a third party to fix its systems? What happens if the third party stops its support? Further research showed that eMoneyUnion had managed to raise £427,580 in a crowdfunding round two years ago, so you would hope that they’ve since employed a talented in-house IT team to maintain the solution. First job as a Bank clerk in 1988 with Nat West and been involved in finance ever since. Trained as an IFA in the 90′s and founder of the first online Finance and Insurance Network. Grew revenues from £30K p.a to £10 million p.a. 1994 – 2004. Experienced FSA authorised individual 1990 – 2008 responsible for risk, compliance and oversight of £5 Billion + of regulated consumer credit and insurance. Led a successful Flotation on AIM in 2002 aged 30. Sold the trading business with FSA regulatory approval 2 weeks before banking collapse in 2008. Been looking for a better way for finance to function ever since. JustUs, www.justus.co a financial community, built on transparency, fairness and inclusivity, has launched, looking to raise £5.35m, including £1m on crowdfunding platform Crowdcube. When I wrote the first version of this review, I was left confused between the difference between eMoneyUnion and JustUs. If you already have a successful P2P lending platform, why spin out a sub company with no brand recognition? The founder Lee Birkett got in touch and we had a call to discuss. One key reason for the distinction is related to FCA approval and the changes required for the new ISAs. It appears that JustUs is now in a very good position to benefit from the Innovative Finance ISA with regards to peer-to-peer lending. eMoneyUnion is one to watch for the Innovative Finance ISA. Speaking to the founder I came away with the impression that they are very aware of the bigger picture and trends in peer-to-peer lending. The guideline rates of return themselves are strong and come with a degree of protection in the provision fund behind it. You are an active investor in eMoneyUnion or have been in the last 6 months. Good evening; great blog! Please feel free to call me tomorrow afternoon. Thanks for getting in touch! Could you send a contact number to me at ‘contact AT p2pblog.co.uk’? After using the site for a couple of years I’ve found it a low-effort, medium return way of earning over 11%. Money takes a while to be invested with the bidpal system, which is the only way I invest. It offers a default selection of loan interest rates and risk bands that you can chase; I tweaked it a bit to cover the higher-return loans and have not noticed any defaults or noticed how the provision fund works; I just look at the percentage return, and, as it’s not too bad, keep a bit of money on the site to keep my risks diverse. Quite a few P2P platforms use other peoples’ software to get going quickly. For example Thincats Australia uses the same Rebuildingsociety software without complaint; the sharing of IT pools money for development and makes the learning-curve less steep for users. When this firm raised some money on Crowdcube I asked them for a little detail and was told that WordPress is just the font-end; the back-end does an a fiddly piece of accounting by which loan parts are allocated to individual lenders – something other industries don’t need and needs to be written for P2P. Just thought I should chip-in with my own impressions. Thanks for the blog and the detailed searching you’ve done.